Growing up back home in India, summers at our household were spent learning new skills. Most parents encouraged their children to take on life skills that would come in handy at a later stage, such as learning to use computers, sewing and music. I took up baking to fill those long summer days and found I loved it. The cake industry has come a long way since the Nineties. The industry has witnessed immense growth, where baking a cake is just one aspect, which is just as important as the decoration that goes on the cake. With the introduction of fondant and gum paste in supermarkets worldwide, anyone who wishes to try their hand at it can do so with the help of just a few tutorials. Icing tools that run the gamut and cake kits that would put a handyman’s toolbox to shame have become popular with professional and amateur bakers alike. Social networking sites such as Facebook allow users to share tips and photos of their sugary creations. Courses in sugar art have gained popularity in and around Dubai. Bernadine Rego started off with a cake-decoration course so that she could make great cakes to mark all the special occasions in her children’s lives. Rego is now a certified instructor for the Middle East market and works for Wilton, which offers baking courses at Tavola, Jumeirah. She travels regularly from her home in Doha to train other instructors in the region. What began as a hobby back in her hometown, Mumbai, grew in Doha to become a career in top-notch baking. Here, Rego shares tips on baking, based on years of experience. Use pans of the right size and fill them up to two-thirds. Leave room for the cakes to rise. Light-coloured pans make better cakes than dark ones. Special baking strips fixed around the cake tins help in making evenly baked cakes. Don’t underestimate the importance of pre-heating the oven before anything, be it pastries, pies or cakes. Do not open the oven for at least the first 20 minutes of baking. 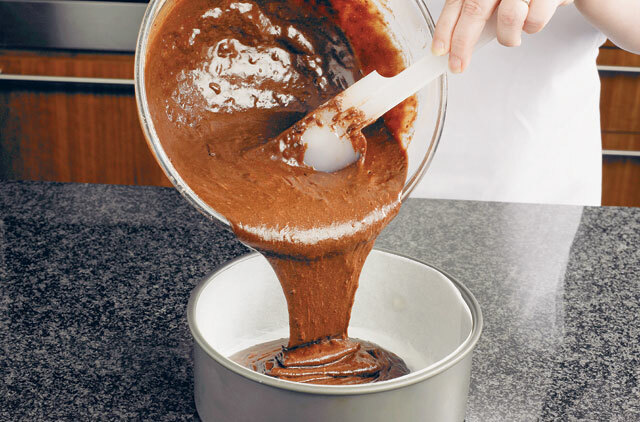 Based on your oven type, it is advisable to turn the cake tin around while baking — but only after the first 20 minutes have passed. Use an oven thermometer to maintain even temperature throughout. Eggs should always be at room temperature before being added to cake batter. Fondant covers a firm cake better than a soft one. Never keep cake tins too close to each other in an oven. Place tins in the centre of the oven. If you want to use fondant flowers, designs or characters, prepare them well in advance. Go for light-coloured baking pans. They are available in various shapes: round, square and rectangular. As for the size, you can choose as per your requirements. Baking strips for even baking and a cake leveller to even out the top of the cake and smoothen it for icing. Cake caddy or carry case that comes with a locking device. This is handy in case of cake delivery. A turntable to work on the icing. A set of icing nozzles for varied effects. Icing colours that can be used with butter cream and fondant icing. Shortening such as Crisco is good for butter-cream icing and for greasing cake tins. A fondant roller and rolling mat are a must-have if you wish to work with fondant and gum paste. Note: All of the above are available at Tavola, Dubai. For more information on baking and cake-decorating courses offered by Wilton, contact Tavola at 04 3445624.